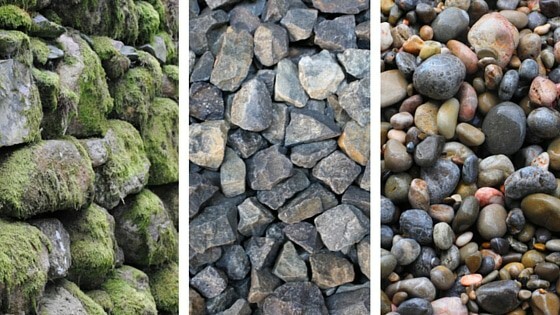 Of these three sets of rocks, which would you rather be? Sounds like a weird question, but let me put them in terms of wellness. The first is a rock wall covered in moss. None of the stones have moved since they were placed in the location. Due to the wet, shady environment the moss has grown and thrived. For wellness, these are similar to people who don't exercise and are afraid to step out of their comfort zone. The second are a pile of rocks. You may see them along the road, in your backyard, or in the middle of a hiking trail. For wellness, they represent people who do a few things to take care of themselves like: go for an occasional walk, eat moderately healthy and/or have reasonably average health. The third and final are river rocks. These have been tumbled around the water, rubbing against each other and the ground to become smooth over time. For wellness, these rocks have taken step after step continuously to achieve their goals. They know change does not happen overnight, but over time and have stuck with it. If we want to see change, we have to be actively working toward change. Believing that we can do it. Finding support. Taking it one step at a time. When it becomes easier, adding a new step. Looking at all factors to make adjustments. Moving as much as we can. Eating more nutritious foods. Not giving up when things don't happen immediately. Forgiving ourselves when we stray and stepping back on the path. Continuing when we reached our goals, knowing that stopping will set us back. Loving ourselves. Again, I ask you, which type of rock would you rather be?